Imagining myself falling of the immense waterfall and freezing like a popsicle stick, I did not move for a few short minutes when we started parking our car near Gullfoss. It was quite difficult not to think of the idea, since everything looks white, and you wouldn’t exactly easily decrypt the difference between an allowed walkway to a dangerous area, not unless you are actually alive and alert – which of course isn’t exactly the case for me. If you have been sleep deprived three nights in a row, being alive and alert aren’t your big priorities in life. Imagination can run wild, and you can be caught looking like a zombie full of anxieties instead of looking like an ever-ready traveler full of adventure! But of course, after our long travel from Reykjavik to Gullfoss, which took around 2 hours - 117.8 km via Þjóðvegur 1 and Biskupstungnabraut, I tossed out of my fears, and acted like a cool dude feeling happy to have finally arrived at the Golden Falls, one of the most impressive waterfalls in Iceland. Known for having a wide curved three-step "staircase", the Gullfoss waterfall’s edge is obscured from view, so that it appears that the river simply vanishes into the earth. What’s more mind boggling though is that it looks way different during the winter season – it looks like a 3D art scene. My numb-from-cold mind was trying to translate and appreciate what I was seeing – the winter waterfall = so impressive and insane! I was walking so slow and watching my step because I don’t want my Go Pro to fall into the snow chasm, especially since the time we visited was a bit windy also! The waterfall’s crevice shows its calm demeanor, as we followed the trail to reach one side of the waterfall. I couldn’t quite recognize the river connected because everything looks white, my eyes were playing tricks on me. It looks so untouched, it’s beautiful in its most raw form. You’ll like how it does not look so touristy in that sense, because it’s left intact. Although there were shy ropes, small warnings, and walking trails here and there, the overall vicinity looks overwhelming in winter. As I was seeing the place, I started to understand why, with Þingvellir and the geysers of Haukadalur, Gullfoss is a must do for everyone who visits Iceland. Fact is, the average temperature in Iceland is around 1 – 2 °C (33 - 35° F) in wintertime and around 12 °C (54 °F) in summer. This means that the Gullfoss freezes in winter and looks way different during summer. 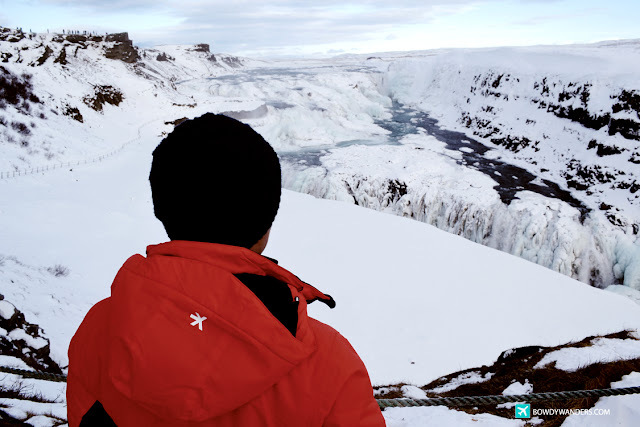 Of course, depending on what kind of experience you are looking from, and depending on where you are from, you may want to see the Gullfoss on both seasons. In summer, I’ve heard that the Gullfoss provides an excellent contrast of colors – if you are lucky, you’ll even see rainbows and thousands of crowds. Also, you can walk around at least 20 - 30 minutes to get the entire view in. Who can say no to that, yes? In winter, during the time we visited, there were no rough water steams and some of the walking trails were closed, so there were only certain areas where we were able to maximize our viewing experience. I didn’t see it as something limited, but it gave us a chance to really just focus on enjoying the waterfall and not doing so much of activities. While I’ve learned that winter time is always great to cuddle up indoors over a nice cup of drink, it’s still a special experience to visit an iced waterfall landmark like Gullfoss in Iceland.